BettaTherm™ Mini Size Betta Bowl Heater | Zoo Med Laboratories, Inc. 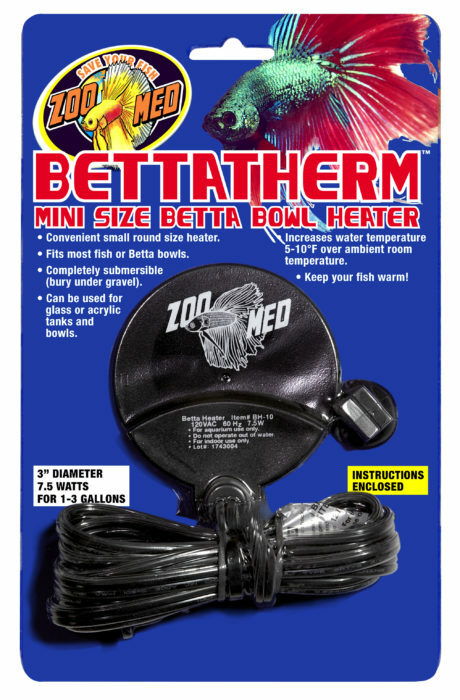 Completely submersible Mini Size Betta Bowl Heater! Increases water temperature 5-10°F over ambient room temperature. Mini Size Betta Bowl Heater! Completely submersible (Bury under gravel). Increases water temperature 5-10°F over ambient room temperature. Fits most fish or Betta bowls. Can be used on both glass and acrylic tanks. Copyright 2018 Zoo Med Laboratories, Inc.